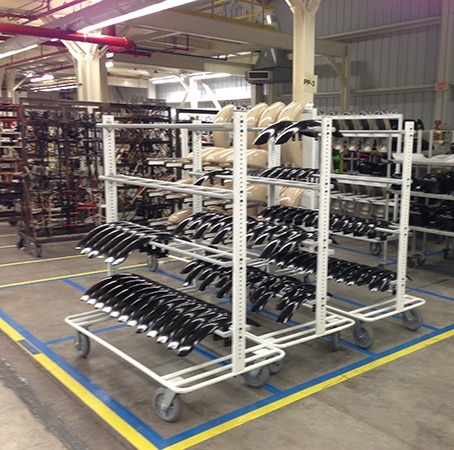 DuBois custom Material Handling Carts will safely move your unique production parts throughout your facility and increase production efficiency. Our carts are engineered with a focus on maximizing cart capacity, durability, ergonomics, and ease of movement. We understand Class A paint finishes. DuBois design carts with both your production parts’ safety and their coatings in mind to prevent damage and defects. We offer the Universal Material Handling Cart, which provides interchangeable cross-bars that enable carts to flex across departments, manufacturing plants, production parts, product models and model years. DuBois Design Engineers are available to visit your facility and manage your material handling cart project from design concept through production. Our design and manufacturing lead-times are unmatched in the industry.